A moody grey day south of Dunedin. Fifth in my New Zealand series. 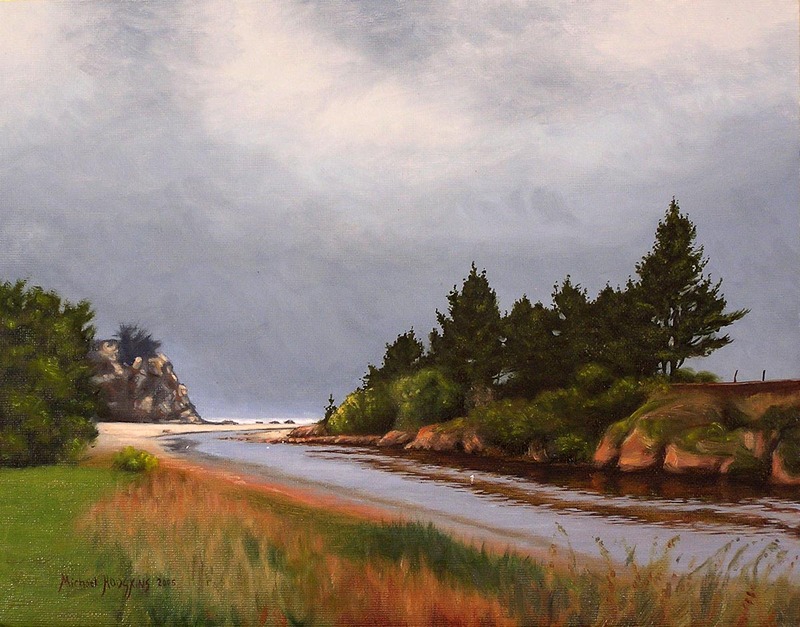 One evening about 6 o’clock, when the wild weather seemed to be abating for a while, I drove down the coast from Dunedin in search of some subjects to paint. A few kilometres from Dunedin is a small settlement called Brighton. There is a bridge that crosses this waterway and around are clusters of buildings. From the bridge I could just see the surf of the Pacific Ocean breaking across the sandbar. Out there it was so windy, cold and wild but here this little stretch of sheltered water was relatively calm and inviting in comparison. In the distance the beach glowed and the white surf pounded as the ominous grey sky bore relentlessly north.